Lego was a large part of my childhood, as it certainly opened up my imagination, and has irrefutably played a role in my creativity today. 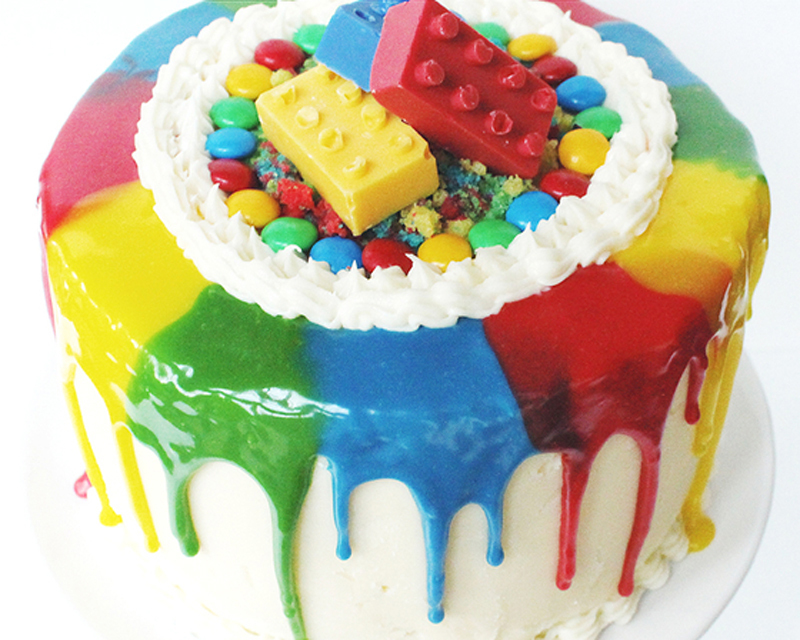 Baking, and the assembling process of cakes, is similar to the likes of Lego blocks. 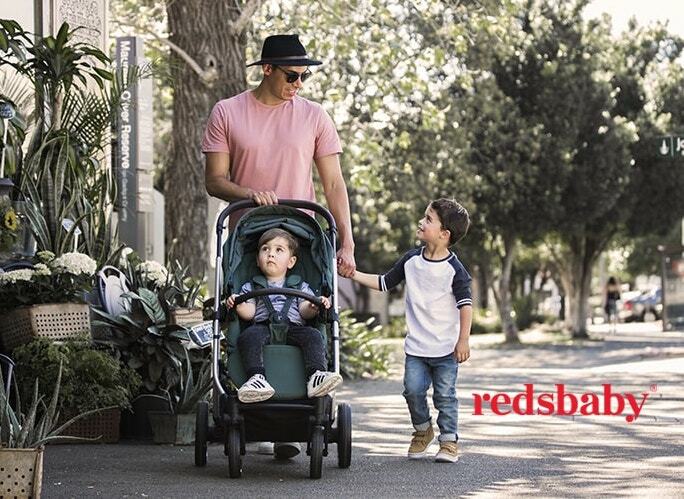 As long as you keep an open mind, the possibilities are endless! 1. Pre-heat oven to 165 degrees celsius, and line four 18cm round tins with grease proof baking paper. 2. Mix sugar and vegetable oil in a large bowl, then stir in eggs, buttermilk and vinegar. Gradually mix in sifted flour with an electric mixer on low speed until smooth and combined. 3. 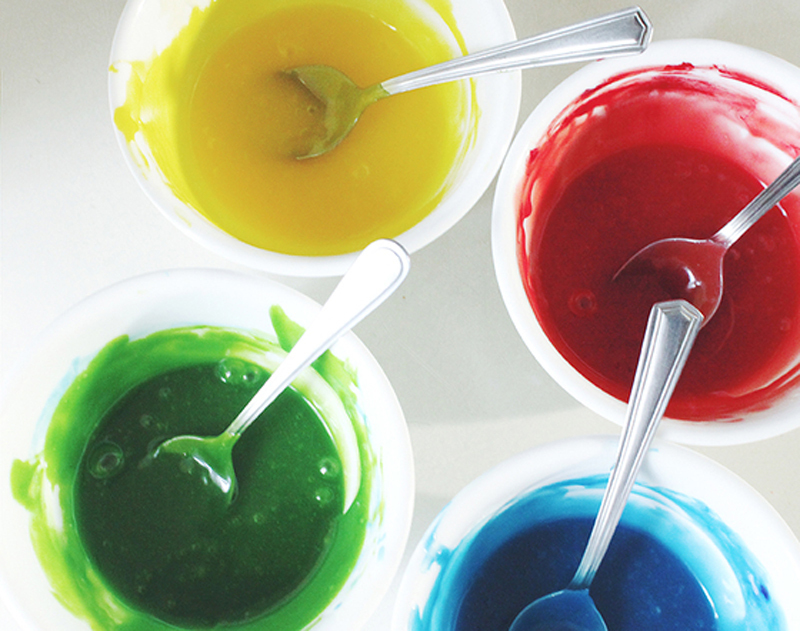 Divide batter evenly into 4 bowls, and dye each a different colour of choice. 4. Transfer batter into cake tins, and bake for approximately 35 – 45 minutes, or when a toothpick comes out clean. 5. Allow cakes to cool in pans for a while, before carefully releasing from tins and transferring onto cooling racks. 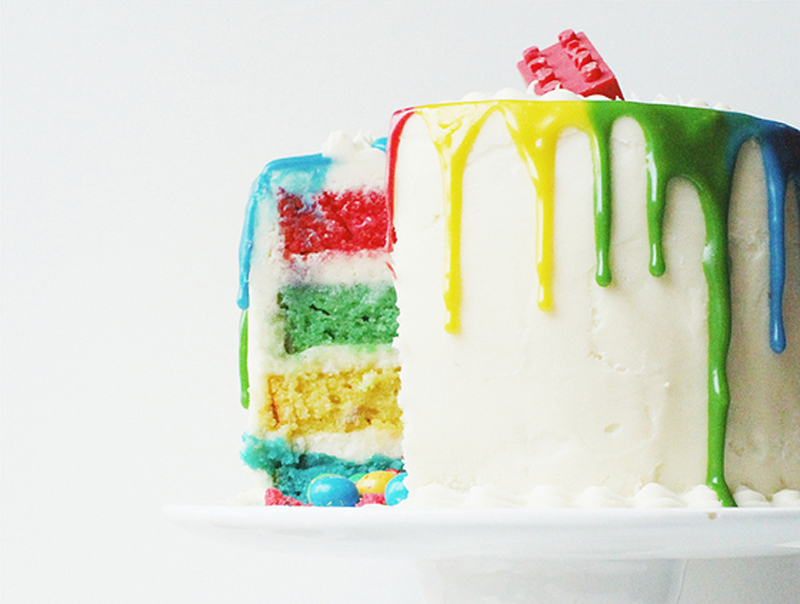 *Note: This cake is quite moist, so ensure to refrigerate to firm up before assembling and levelling off! 1. Level off the cakes (keep the scraps), and place icing in a large piping bag. 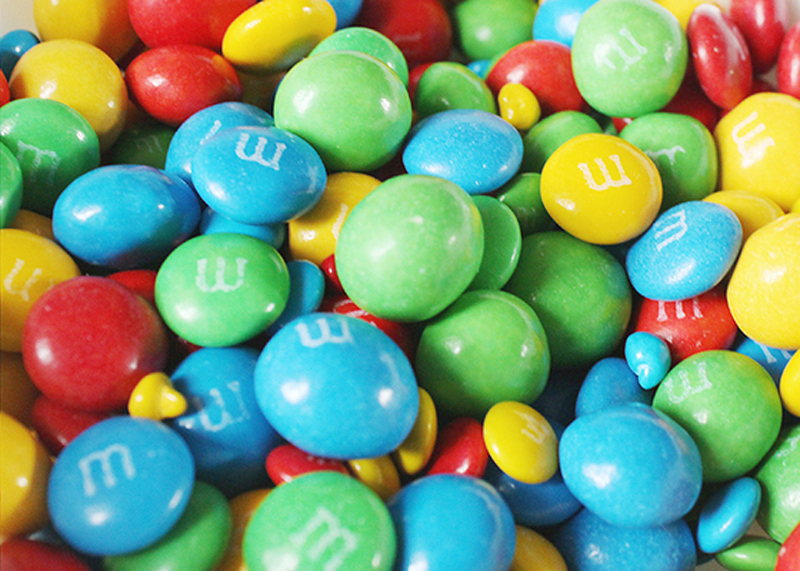 This is optional, but I find it easier to decorate – especially with the candy filled centre. 2. 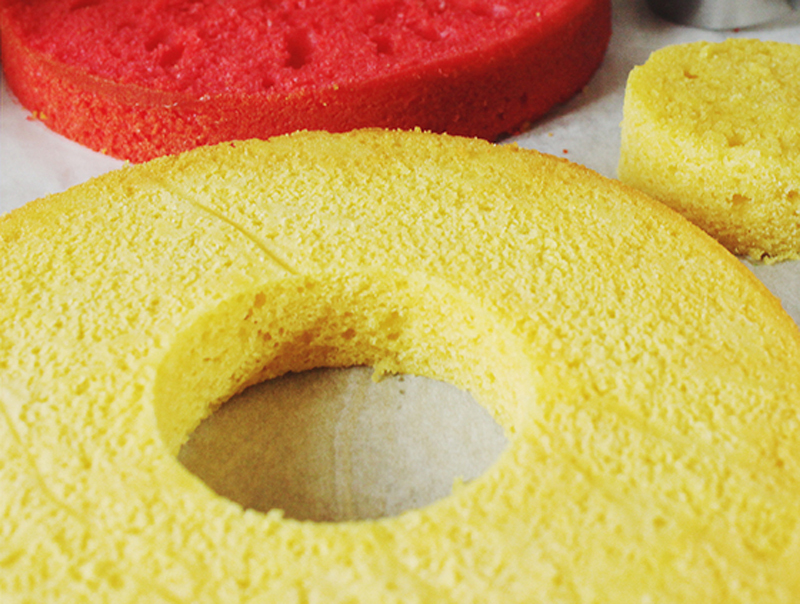 Using a circle cookie cutter (about 6.5cm in diameter), cut out circles in the centre of two of the cake layers. 3. Smear some icing in the middle of a cake board to act as ‘glue’ to secure the first cake layer down. Pipe icing on the outer edge of the cake, leaving a circle (the size of your cookie cutter) in the centre un-iced. 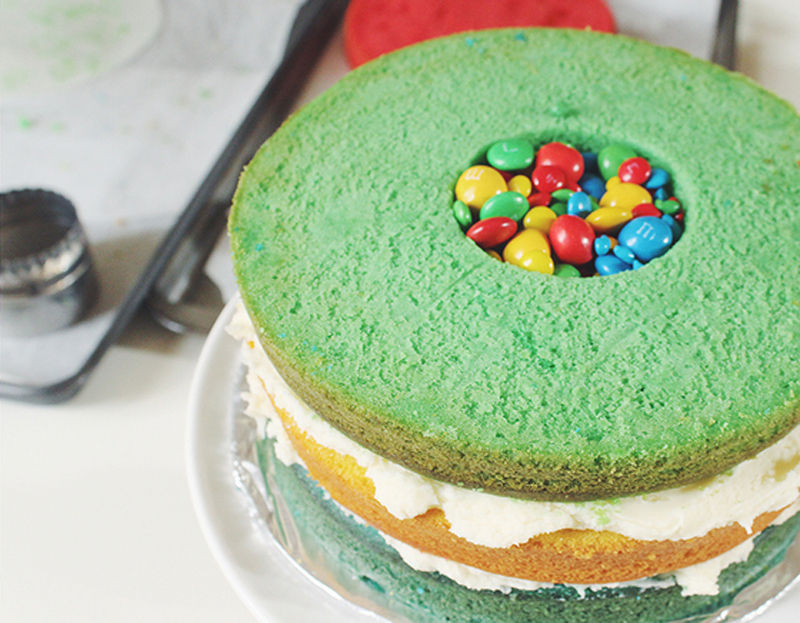 Place one layer with a cut out centre on top, and ice cake as before. Repeat this step with the next layer. 4. 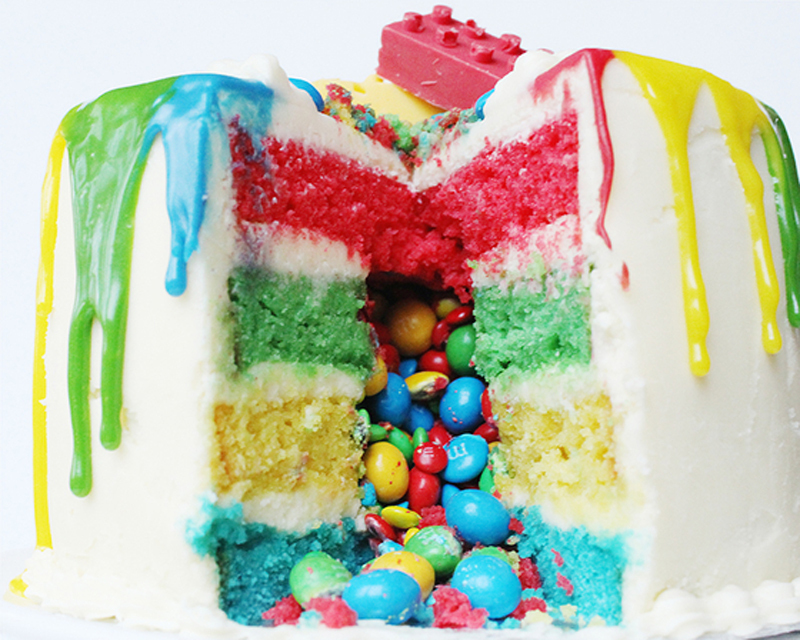 Pack as much candy as you can into the hole, then ice and seal with the last cake layer. 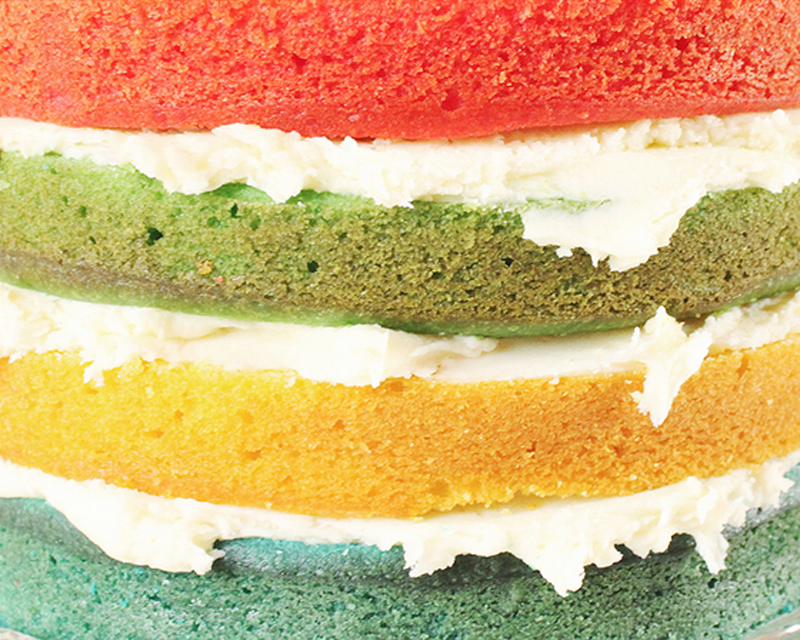 Crumb coat your cake and refrigerate until icing firms up. 5. Ice the rest of the cake. Transfer the leftover icing into a piping bag with a floral icing tip. Place back into the fridge to firm up. 6. In the meantime, make white chocolate ganache to a dripping consistency. I usually use a 2 to 1 chocolate to cream ratio. 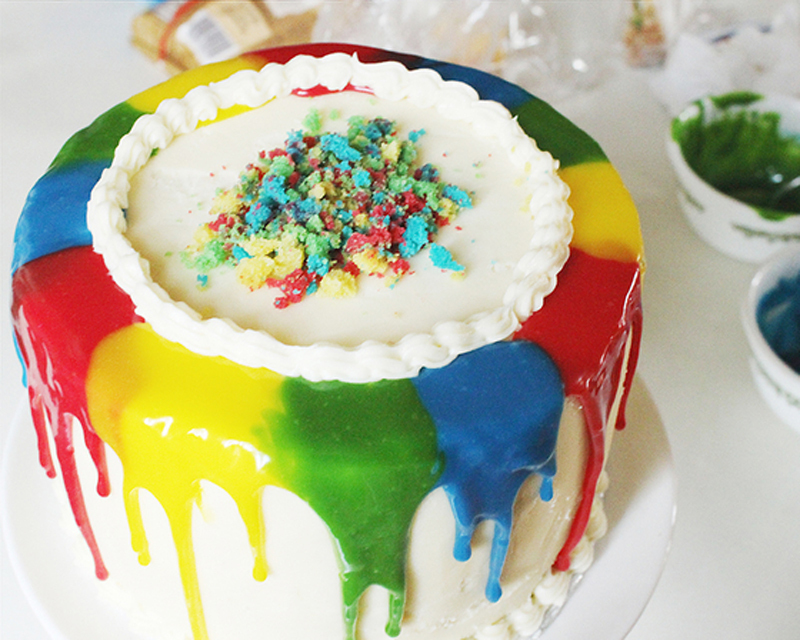 Divide into 4 bowls, and dye into same colours as the cake. Allow the ganache to slightly cool before decorating the cake, so it doesn’t melt the icing! 7. A small portion at a time, carefully spoon the ganache close to the edge of the cake, allowing it to drip down the sides. 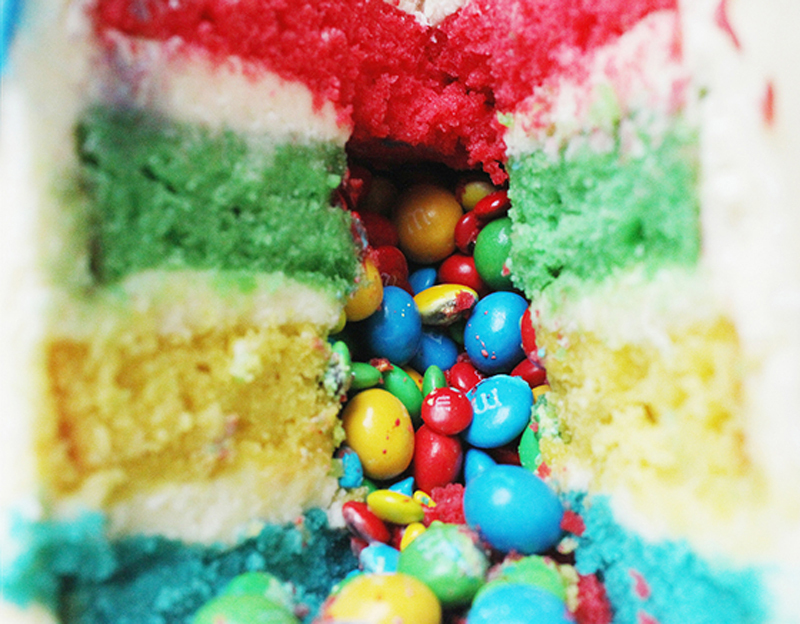 Continue to do this around the whole border of the cake, alternating colours each time. 8. Pipe two circles of icing where the ganache ends on top of the cake, and place M&M’s in alternating colours around the inner edge of the icing. Fill the centre with cake crumbs. 9. 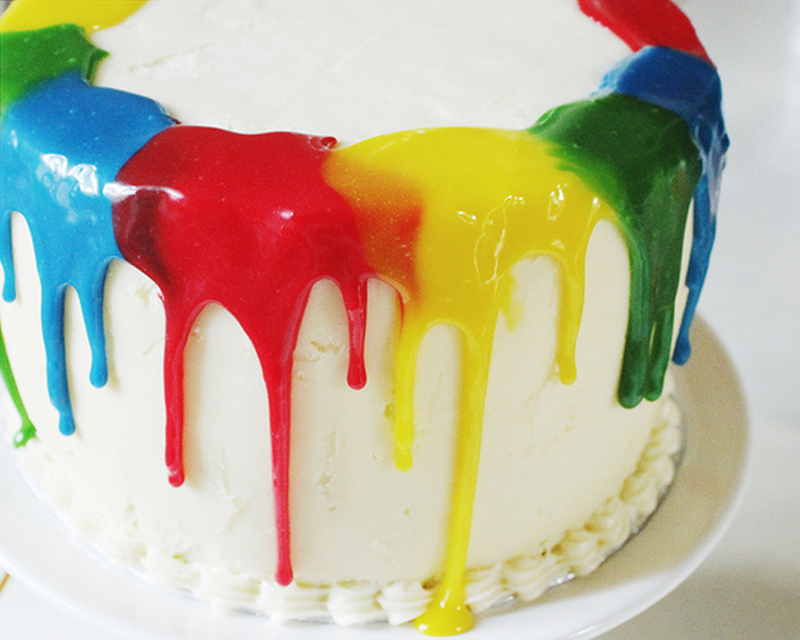 Melt some white chocolate and dye into chosen colours. 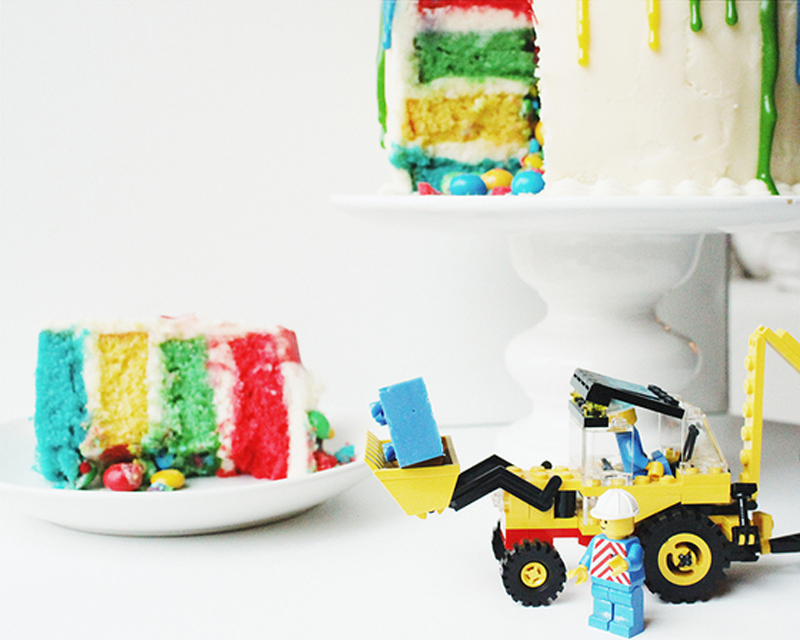 Pour into Lego block mould and place in refrigerator until set. Release chocolate from mould, and adorn in centre of the cake.